2018 is an amazing year for 360 cameras. A lot of firmware updates have been made which only means that high-end priced 360 cameras have slashed their prices. And that is where we come in. Which of these brands is affordable without being rendered redundant? We are not going to be looking at GoPro Fusion, it’s not a cheap camera, and you will need good software to use it. We also wish the Insta360 One would have made it, but we are all about 360 cameras under $200. Insta360, Samsung, and Rico Theta are some of the best 360 camera brands of the market. You should look forward to reading about their cameras. Whether you want a camera for the outdoors, VR, one that you can clip to your phone, or a fun selfie stick camera, don’t let your wallet keep you from seeing it all. We have researched the market to find the Best Cheap 360 Cameras. Where will the content be Viewed? When you have a multiple camera setup, it means you have to stitch everything together from all your sources. You’ll have to consider the available stitching software as some of them are too complicated to use. You will want to have more control over the content if you don’t want to see images that disappear around the stitch line. Shooting with a 360 camera is not anything like a standard camera in terms of resolution. You will notice that once you upload the videos, the resolution can go down significantly that is why you will need the highest possible resolution.4K resolution is great especially if you are into vlogging. This feature determines how smooth your videos will be. To capture videos that are similar to a film camera, you will need to consider a 360 camera with at least 30fps. The lenses are the most crucial aspect of a 360 camera. The more lenses your camera has, the better it will be at making a 360-degree image. You will also want to know about its ISO range and the shutter time to be able to have an idea of what it is capable of filming. 360 content takes up more space than regular videos. Your camera will need to have to support at least a 32GB SD card if you wish to store lots of videos and photos. But if you get your hands on one that supports 64GB, the better for you at an affordable rate. Getting the longest running time is what you will want in a reliable 360 camera. But these cameras need to process a lot of stuff, so the longest you may be getting is a few minutes to an hour. A camera with rechargeable batteries sets you for life. But it not so much a better pick over interchangeables if you need to keep recharging the battery every couple of minutes. 360 cameras come in diversified sizes. A portable camera is appealing if you are shooting in the outdoors, and are carrying lots of gear. But if you need more features a small camera may not give you all that you are looking to get in 360 filming. How reliable is the connection to the app? Will you be experiencing any glitches and are there bugs that need to be fixed? It’s essential that the app be user-friendly opening up possibilities for making your shots perfect and worth reliving. Why we like it: This camera is rugged and water resistant to help it deal with the outdoors. It is best suited for action shooting and bringing all your outdoor memories to life. 360fly 360 HD video camera comes with an adhesive mount that allows you to use it independently. It is a small portable device that is barely the size of a tennis ball. The camera has only one button which turns the camera on and also acts as a shutter button. This means you will get more out of the companion app which opens up possibilities for shooting time-lapse videos and 16:9 format POV videos. It is going to shoot 360 videos above and horizontally like most small action 360 cameras, but it does not have depth perception because it has only one lens. You can get different mounts for this camera so that you can attach it to various devices like a helmet. This way, you will be shooting videos hands free. The battery gives you up to two hours of recording. You get 32GB internal storage so that you can start recording right away. The videos can then be transferred to your smartphone and edit them with the 360fly app for iOS and Android. You can shoot videos that are viewable on social media platforms where they can either be interactive or non-interactive. An interactive video will let your viewers scroll through the 360 video that you made, or you can choose the angle of view that you would like the videos to be watched. This camera is also VR ready which gives you an opportunity to experience more by watching your footage with VR devices. Getting a 360 camera that is rugged and water resistant is a huge plus when you want to capture the action no matter the outdoor conditions. 360fly lets you experience life more by being a good companion. Use it with a variety of accessories and never miss a thing because it can keep up with any lifestyle. It has a durable housing that is water resistant to 33ft. Why we like it: It gets lifelike details on both videos and still shots. It is built to withstand outdoors rigors, and it comes with accessories for attaching to handlebars and helmets. A great action 360 camera. You will notice that the Gear Pro 360 is not only one of the smallest 360 cameras, but it is also rugged. It may not shoot the best quality videos, but you get 1080p HD videos that are nice to watch on screens and your smartphone, but not so much on VR. This camera is Wi-Fi ready. It will connect to your smartphone where you can use the OTCAM app for iPhones and Android as a viewfinder. It lets you see images in the eye of the camera so that you can know which areas you want to prioritize. It has a slot for an SD card that lets you store files and transfer them directly from the camera. With a mini HDMI port, you can connect to an HDTV and watch footage on a big screen giving you a more immersive experience. We like all the shooting modes in this camera. They include shooting of time loop videos in bursts of 1, 3, or 5 minutes. It also offers a motion detection feature that comes in handy when you want to use the auto snap feature and image burst photos. The image resolution can be adjusted from the highest 12MP to 8MP, 5MP, or 3MP. It has a mini LCD screen that lets you operate the camera independent from your phone, so you don’t have to bring your phone near water. Gear Pro 360 may not capture the highest quality footage. It is, however, small and durable. The camera captures in full 360, and it comes with an HDMI port. For such a small device, we fill not much could have been done to improve the features as only so much can fit in its footprint. Why we like it: This is a quality beginner’s 360 action camera. It has over 2 hours of battery life when the Wi-Fi is turned on and provides up to 8 hours of standby time. Most 360 action cameras are mind-boggling like the Garmin Virb 360, but you will have to cough a good amount of money to own it. 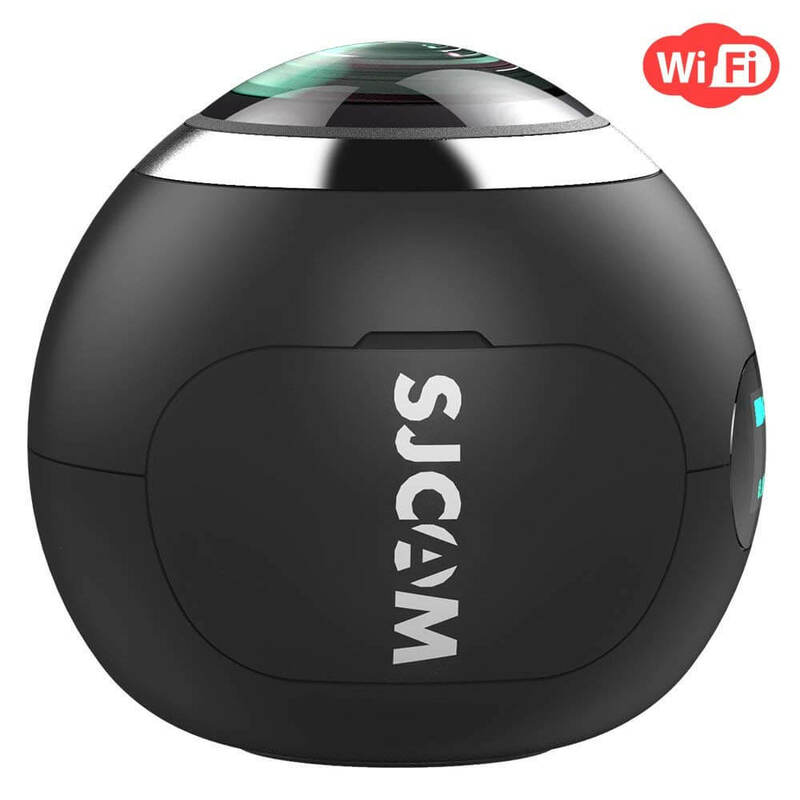 For an action camera that won’t starve your pocket but will give you remarkable shots, SJCAM 360 is an excellent choice. It shoots videos in 2K using a single lens. It will not cover full 360 landscape, but rather you will be getting 360 x 220 degrees view. It will also shoot 1440p and 1024p videos all at 30fps. It does not have many choices when it comes to resolution, but the camera is keen to deliver on the quality. It gives you six different modes from VR to panorama, fisheye, cylinder, and hemisphere. Using the threaded hole connector, you can use it with a ton of accessories like a selfie stick to shoot different mode videos. We particularly like that it can be connected to a drone to provide space-like images and videos. This camera supports instant sharing using the SJCAM app. You can surprise your friends on Whatsapp and Wechat with breathtaking photos and do not forget your followers on IG who are always looking for something new to blow their minds. The SJCAM 360 has lots of highlight features for an action 360 camera. It shoots in different resolutions to help stretch the battery life. The only thing we didn’t like is the form factor since it is top-heavy, it will not sit still on a flat surface. Why we like it: It captures 360 videos and images with one shot. It is a high-performance model that can be enjoyed by absolutely anyone. 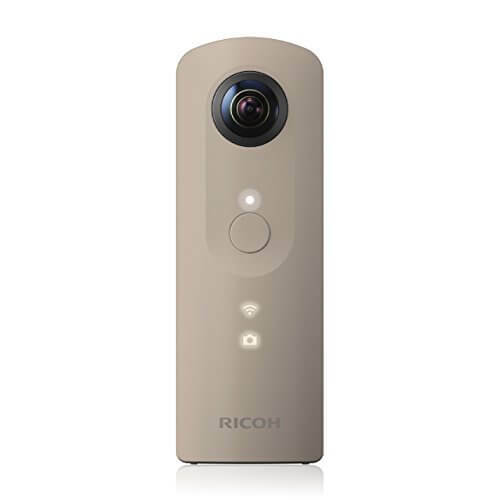 Ricoh Theta SC is an inexpensive 3600 camera that expresses quality and shoots videos and images in amazing quality. 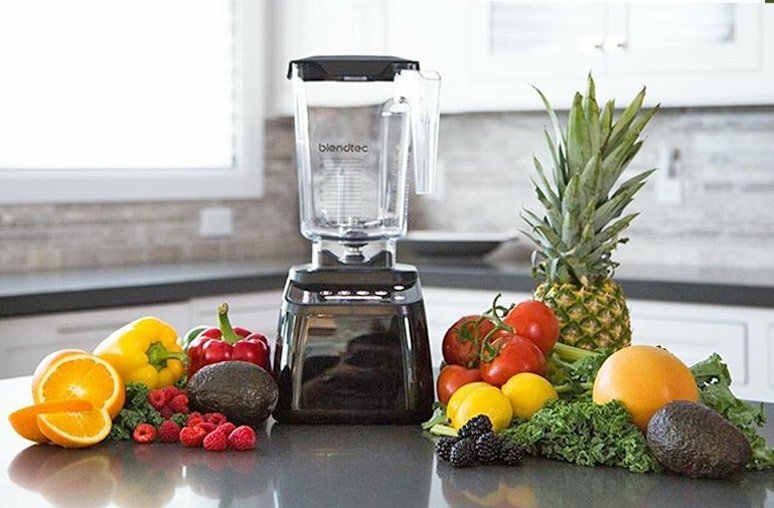 It has a simple configuration on the exterior that makes it super easy to use. A beginner and an expert will have much like the same experience while bringing your memories close to you. This camera has folded twin-lens optics that allow it to take the streamlined shape. It is a portable design that you can take on outdoor excursions. The camera captures video in full HD 1920 x 1080p and images at 14MP. It sits right in with entry-level cameras that offer high-resolution recording. 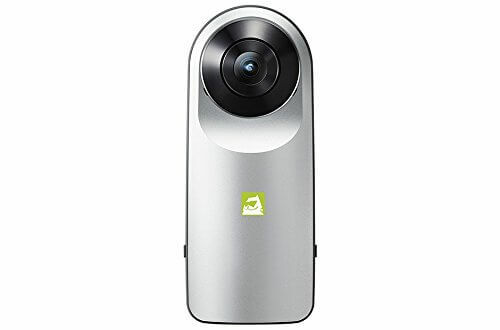 Ricoh Theta SC is compatible with Android and iOS devices. With the Theta + and Theta + V apps, you will be able to edit your content and make it shareable on social media sites such as Facebook, Instagram, YouTube, Tumblr, etc. The apps are pretty basic, and we don’t foresee you having any problems with your videos and photos. The apps allow editing of time-lapse videos, adding background music, cropping images, and many others. This camera is even compatible with Street View app which lets you record and share 360 photos as street view to Google Maps. The camera also has a host of white balance modes so that you can make the colors in your pictures warmer or cooler according to your liking. The camera will perform the white balance automatically on videos so it will be depicting scenes as they should be in real life. Looking at all the features represented by the Ricoh Theta SC, it is without a doubt that is going to be a good purchase. We would recommend this camera because of the constant app updates which makes your videos at par with those of users having more expensive models. Why we like it: This camera is easy to use. 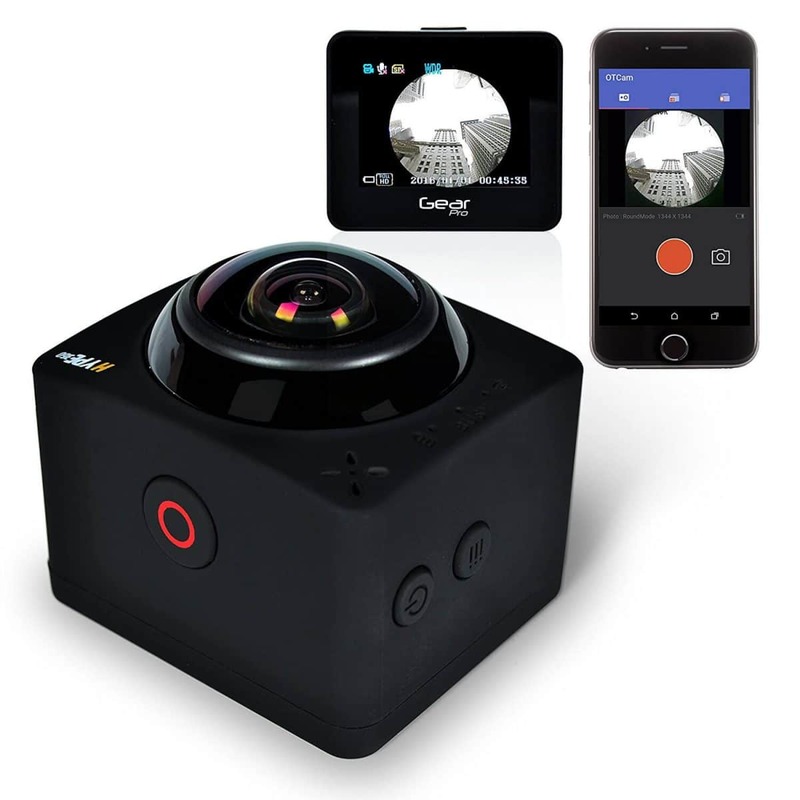 It captures full 360 photos and video with two fisheye lenses, and it can pan images to give your shots speed and movement. Great for photos. 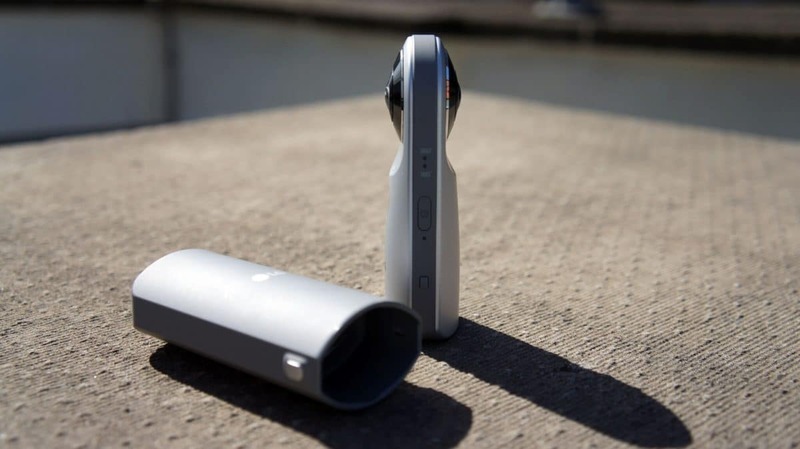 The Ricoh Theta M15 is the most exciting cheap 360 camera for shooting still photos. It has two 180-degree lenses that capture a fully encompassed picture in a single shot. Although it won’t shoot the area below the camera, you can edit all that with Ricoh Theta’s companion app. This camera supports Wi-Fi to help in controlling the operations of the camera. You will like that you can zoom and pan around a scene to give you a feeling like you are in the action. It is the most exciting way of reliving life’s most special moments. You can achieve so much with the app from swiping to rotating, pinching, re-sizing, and changing the shape and composition of your images. You can actually use it to take some awesome professional photos and get to share them on Facebook, Tumblr, Twitter, and Instagram. The spherical nature of taking images is everything to this camera. You can do so much with it, but the most interesting is creating 360-degree panoramas. You can capture up to 1200 photos and store them on the 4GB onboard storage. The two microphones on top of the device work to capture sound on your videos. You will love how easy it is to use this camera. It has a few buttons that are easy to master including the power, shutter, and wireless buttons. It will sync all your photos automatically to your phone or PC for viewing. Ricoh Theta M15 is excellent for 360 photos and videos in only one shot. It enables fast Wi-Fi transfers that let you share your images with friends and family. If you are a selfie enthusiast or are starting out in 360 photography, you will be pleased with both the photos and the support software. Why we like it: It shoots videos in 4K and supports live streaming. The software has been upgraded to a much better version that is easier to use. 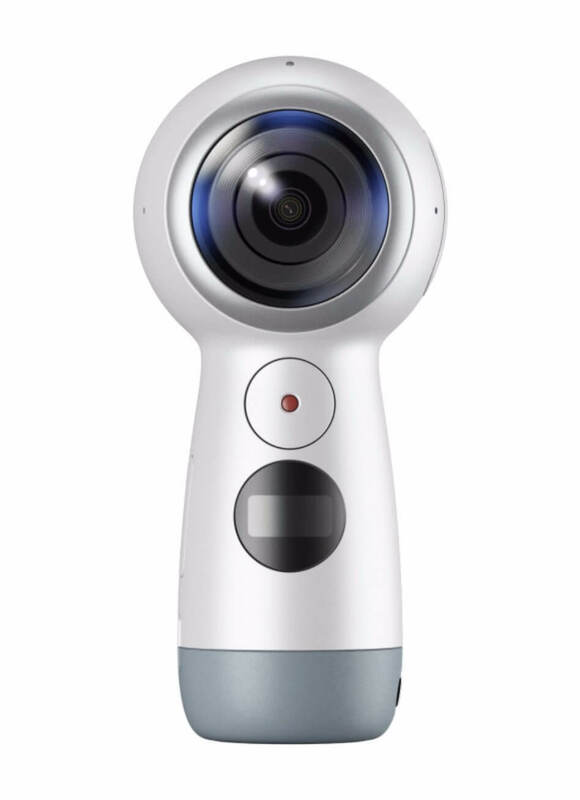 After some of the drawbacks on the Samsung Gear 360 2016, we were a bit hesitant to look into the 2017 Samsung Gear 360. But customers are vouching for it, and we can see why. First, this camera comes at a fraction of the price of high-end rigs, and you get to shoot videos in 4K and full 360-degree images. It is compatible with Samsung smartphones and iPhone 6S, 6S+, 7 and 7S users although there are functions that are still limited for use with iPhones. Looking at the design, the camera comes in the form of a small globe that sits on a tripod. You will be able to attach a rubber ring at the base for stability when you want it to sit on a stable platform like a desktop. This camera charges via a USB-C port, and you will be able to use the camera when it is still charging. You can look forward to getting up to 90 minutes of video recording time which is one of the best considering the price. It uses Wi-Fi connectivity to transfer files, but it takes long unless you have a Samsung S8 or S8+. Two lenses that capture 4K videos complement the sphere shape of this camera. It supports live streaming in 1920 x 960 quality. It is a small price to pay since you will also be performing live stitching and uploading your videos directly online through the app. The Samsung Gear 360 app has seen some significant improvements which makes it more useful for editing and converting your videos. The app is only compatible with Samsung and iPhone users. It is remarkable to see that it will perform automatic stitching and converting of files to the supported format without changing the resolution. Samsung Gear 360 2017 model will undoubtedly open up new worlds close to you. Its quality of videos is outstanding especially because it does not reduce the resolution on Samsung phones. iPhone users will see a reduced resolution, but if you are looking for a 360 camera to test the waters, you are better off considering this model. 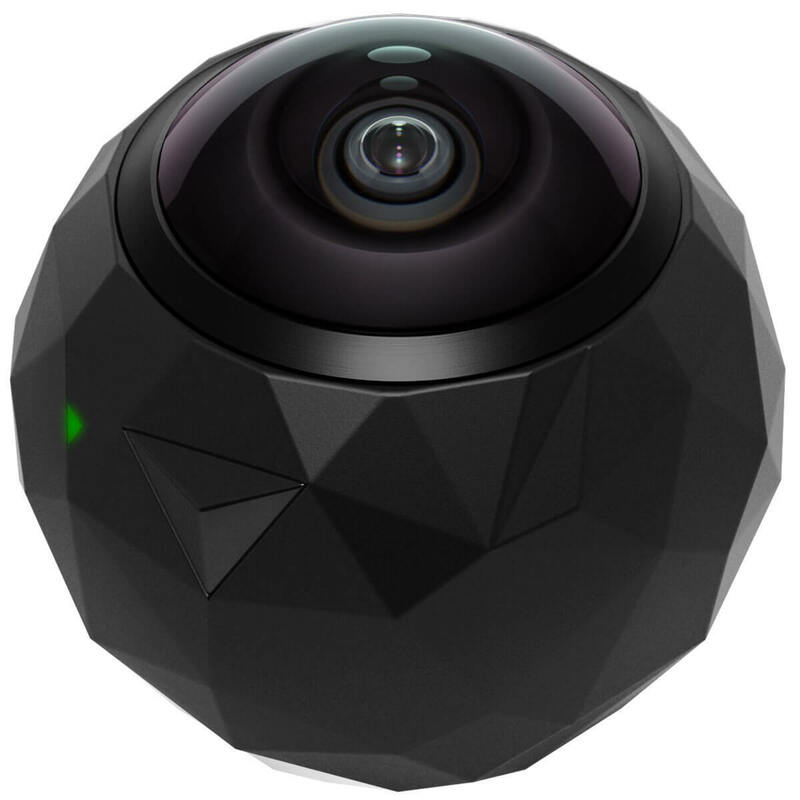 Why we like it: It turns your Android smartphone into a 360 camera. It supports live stitching and streaming to YouTube, Twitter, Facebook, etc. 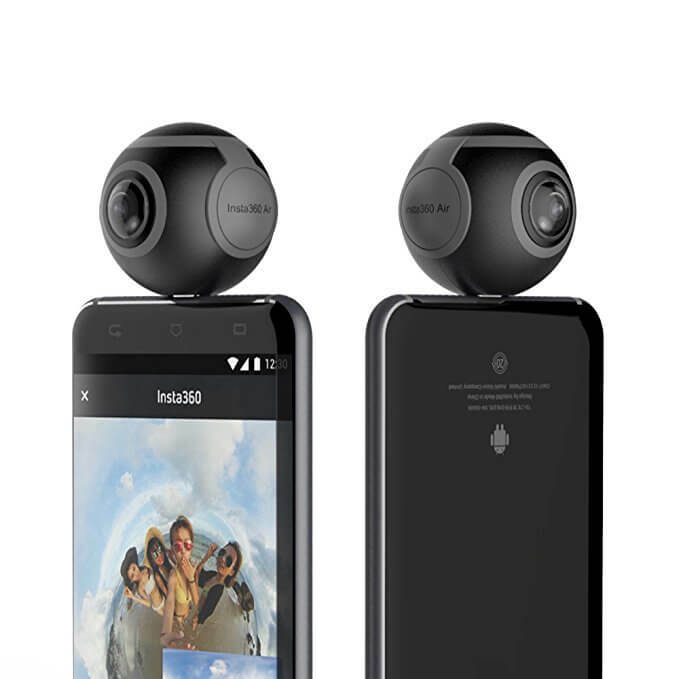 Insta360 Air 360 is a lightweight and compact camera that will connect to your phone via a USB type C. As long as your device runs version 5.1 or higher, you can start experiencing the wonderful aspects of 360 imaging. This model also follows a spherical design with dual 210-degree fish-eye lenses. It weighs very little, so you don’t need to worry about how it will sit on your phone. The camera captures videos in 2560 x 1280p resolution at 30fps. It renders images in great color and contrast so that it will represent lifelike footage. It has an even better resolution for still images at 3k meaning you can capture every single detail. This way all your memories will live on as they were, even as years roll by. We like that it supports live streaming by sending videos directly to your phone such that it will stitch them automatically so you can upload beautiful content for the world to see. Plugging this camera into your laptop will give you a 360 webcam using a USB cable. It will help you hold meetings in professional settings by rendering images that represent the best aspects of your meetings. This camera is a good option for taking VR videos. It has a VR mode that you can easily switch to and with the help of its advanced stabilization algorithm, you will have still videos that are worth reliving with a VR device. If you want an ultraportable 360 camera for your Android smartphone, Insta360 Air has convincing reasons why it is for you. From quality images to live streaming and an app that will bring it all into perspective, Insta360 Air has your back. Why we like it: This camera is freezeproof to -10C, dustproof, shockproof, and water-resistant. Although it is not forgiving when you drop it in water, it is the most rugged design you can get for the money. A yellow square base and a spherical lens will give you full 360 shooting instead of using multiple cameras. 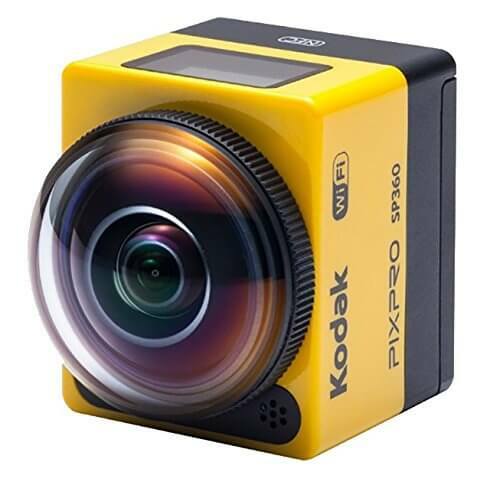 Kodak PIXPRO SP 360 lines up with outdoor excursions as it is aimed at taking a decent beating in the outdoors. This camera uses a more advanced MOS sensor that has 16million image pixels. This is the full-color spectrum so you will see images that are crisp clear as you shoot in ultra wide full 360-degree. The camera can be mounted up or down, and you can get images from whichever angle that you choose. If you want to an immersive experience of the videos you upload, it will deliver action from all sides. When it comes to uploading of videos, it will not support live streaming, but you can get a 16:9 ratio full HD video that has been compressed into a format that is familiar to social media sites. Videos in this format have minimal lens distortion and are scrollable with a mouse. This camera records videos 5 or 10 minutes at a time. It does not offer 4K shooting capabilities, but you will get loop and time-lapse recording. It also offers a motion detection feature which allows the camera to start recording when it detects movement. It syncs with your smartphone such that you can make shooting commands and see what the camera is seeing on your smartphone. It also has a ton of accessories that can make it entirely waterproof for water activities like scuba diving. There’s a lot to say about the Kodak PIXPRO SP360. It allows you to capture so much more and get a better view of your photos and videos. It is flexible, easy to control, and its content can be uploaded on social media. You get a free editing app that is straightforward to use too. Why we like it: It is a sleek camera that is a favorite option because of its stunning pictures. Photos and videos are compatible with Street View and YouTube. LG G5 Friend’s 360 Cam is perhaps the easiest way to encompass your world in a single shot. It will shoot VR videos that you can watch using VR devices or upload your videos on YouTube and photos on Google Street View app. This camera is short and sturdy, such that it fits perfectly in the hand. 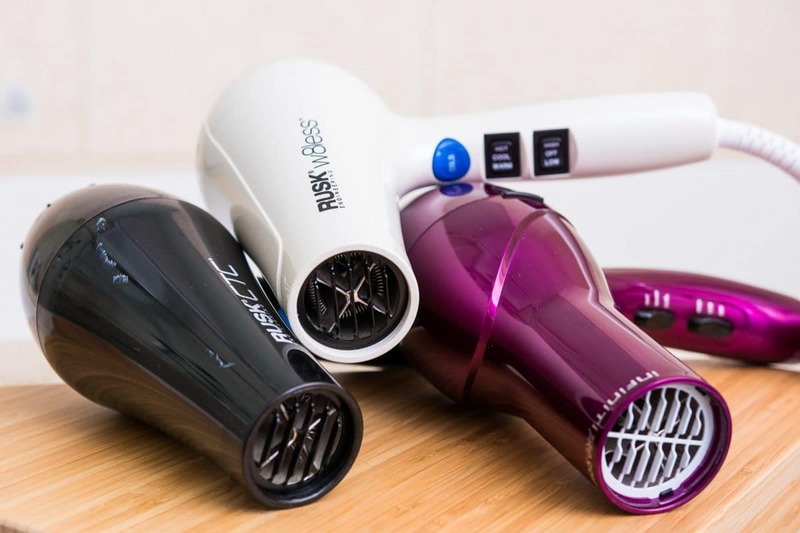 It does not lead on the features just by looking at it thanks to the subtle design that keeps it simple and portable. Once you remove the cover, you will get a full glimpse of the two lenses, one at the front and one at the back. LG offers full 360 shooting, but you can opt to use one camera at a time when you don’t want 360 images. It shoots in 2k to give you smooth videos that are perfect every way you look at them. The camera has to use your smartphone for remote controls as it comes with only two buttons and it does not have a screen. But it can take videos and photos using the shutter button when it is not connected to your phone. The mobile app is everything with this camera. Once you turn on the camera, it will appear on your phone’s Wi-Fi Settings for quick selection. With the app, you can opt for the automatic or manual settings. In the manual mode, you can control the shutter, white balance, ISO sensitivity, etc. You can set the timer from 3-10 seconds so that you can take images at a better angle. This will lessen distortion and give you clearer images. LG G5 is an easy pick for smooth videos and excellent photos. It is more pleasing to see the videos you create on a bright day. 2K is a good start for a 360 camera, and the companion app provides simple editing. It takes shareable content that does not distort to a high degree once you have converted it. Why we like it: This pocket-sized camera will give your iPhone the ideal setup for a 360 camera. It connects to your phone using a lightning plug, but it can shoot footage on its own. 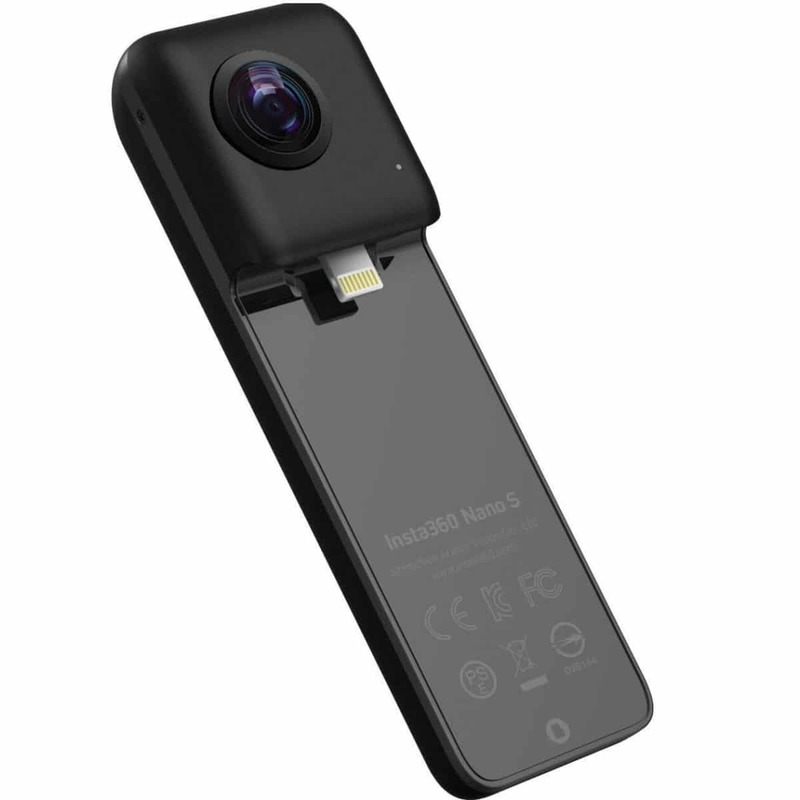 Insta360 Nano S 360 is a small module that has two fisheye lenses. Together, the two lenses capture 4K 3600 videos and 20MP still images. 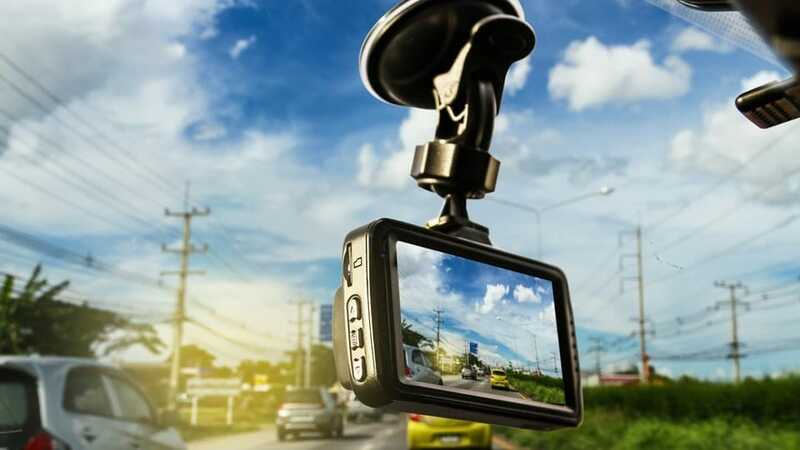 This camera comes with a list of intuitive features including Multiview which allows you to record videos from every direction, and later, you can arrange the views in one frame. It is a great feature for live streaming and video chat since you can have five split-screens and up three simultaneous angles. Now you will be able to achieve personalized shots. It has one of the most unique features; the free capture mode where you can aim anywhere you want and capture everything you want. You can then note what is important and use it as the highlights of your shots. Other useful features are the real-time stabilization and one-touch sharing that allows you to stream 360 videos on social media. Now you can blow up Instagram with immersive live videos. Insta360 Nano S uses gyro stabilization to capture smooth images even in circumstances where your hand may be shaking like walking fast or playing a game. This also counts for the smooth VR videos that you can capture with this camera. When used as an accessory for your phone, you will be able to use Insta360’s app as a viewfinder. This way, you can swipe your images around apply all the tricks you need including the one that turns your images in a pencil sketch. If you have spent all your money on the latest iPhone X, then blowing more money on a 360 camera is not the best idea. But Insta360 Nano S gives you the convenience of turning your iPhone into a 360 camera. It offers real-time stabilization meaning its ready to share anywhere at any time. Even before the dust on GoPro action camera settles, there’s a new photographic and video technology known as 360. It lets you capture photos and videos in full 360-degree panorama. These cameras use multiple fisheye lenses that provide the immersive experience offered by a 360 camera. YouTube and Facebook support uploading of 360-degree videos and photos. Now you just have to know the features to look for to shoot the best content to indulge your fans and followers. It’s so much fun shooting with a 360 camera. Here are some of the benefits of 360 cameras. More and more people are using virtual reality either for fun or professional work. With a 360 camera, you can shoot your content which you can watch later using a VR device. There’s an increasing demand for virtual reality content so you can take advantage of a 360 camera to bring your content to users looking for new material. Video hosting sites like YouTube and Facebook are great ways to share your experiences. Shooting with a 360 camera makes it more memorable making it more popular if you are looking to get more subscribers. 3D TVs turned out to be a fad, but 360 cameras are taking off first. You can spot a few films that have used this technology, and this is just the beginning because as technology advances, professional 360 cameras will be more affordable. These are the most common types seen in consumer models. They are mostly used to create video hosting content that has flat renderings. They do not perceive depth, but you can move around the space. The filmed video involves shooting with one camera and then stitching the field of view from other cameras to create the full image. This camera uses two lenses for each eye which creates a 3D experience. It separates the input for each which results into a more immersive video and shot. This content can be viewed using VR devices. The 3D aspect is what creates the depth perception and makes VR watching lifelike. This is a useful aspect of 360 cameras since you need all the support you can get to utilize all the specs of your camera. This is in terms of the supporting software that turns your video into shareable content. Reading reviews will come in handy here because you will get first-hand information about the experience of other users. Most 360 videos will need editing. The process needs to be fast and straightforward whether it happens on the camera or using a smartphone or computer. It should be a painless experience so watch out for cameras that are good on paper but will give you a headache when editing your content. VR reality is a popular stage for viewing your 3D content since you only need to tilt your head and feel like you are really in the action. YouTube, Twitter, Tumblr, Whatsapp, and Facebook are allowing uploading of 360 videos on their sites. The viewers will navigate the footage using a mouse after you have modified it. 360 videos can also be viewed on your phone by tilting it in different directions. Shooting of videos and taking shots are the basic features of a 360 camera. But you can have more features like stabilization, slow-mo and timelapse, live streaming, 3D sound, etc. The places you take your camera will determine which camera you take. Even if yours may come cheap; at least look for robust bodies and dust resistance. Some will even offer splash resistance and water-resistance covers for water excursions. We can all agree that finding a 360 camera can easily be a process of trial and error. But we want you to get it right the first time with our Best Cheap 360 Cameras. You will get to capture the world as you see it and enjoy lots of ways you can engage your 360 camera. We did not count on these cameras to have bleeding-edge specs, but they wowed us in ways we never imagined. You too can start capturing life in 360 with a practical and affordable 360 camera.